FREE Floor Sanding & Finishing Quotes! Install, Restore and Maintain High Quality Wooden Floors! Floor sanding is the process of removing the top surfaces of a wooden floor by sanding. Floor sanding usually involves three stages: Preparation, sanding, and coating with a protective sealant or finish. Almost all sanding jobs nowadays are completed using specialised sanding machines. The preparation involves punching down or removing all nails which protrude above the boards and removing staples or tacks to reduce the possibility of damage to the sander. After the floor is prepared, the sanding begins, starting with coarse-grit papers then finally a finishing machine. The sanded floor is then coated with polyurethane, oils, or other sealants to give the floor the desired finish. Floor sanding & finishing companies specialise in installing, restoring and maintaining high quality wooden floors. Using the latest sanding technology to offer the best finish while minimising the dust contamination. Many finishes used today by reputable firms are low odour and eco-friendly, normally using water based lacquer and natural oils. 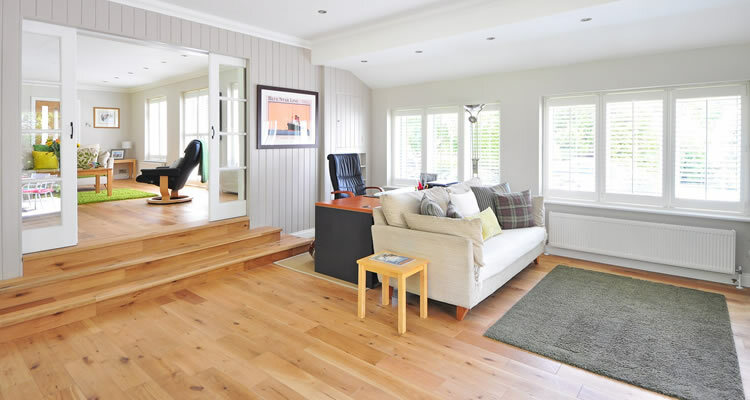 Floor sanding companies generally quote prices per square metre, with options for a number of different finishes plus a sanding only option for those confident enough to apply the finish of oil or lacquer on a DIY basis. Prices are normally quoted assuming a clean floor ready to begin sanding, if you need carpet removed there will often be an additional charge of around £20 per carpet, the disposal of old carpet is also not normally included in prices. Floor sanding only prices start from around £12 per m2, adding 3 coats of clear lacquer brings the price up to around £15.00 per m2, with extra coats of lacquer, hardwax, oil or stain from around £4.00 per m2. Sanding plus 2 coats of hardwax oil or 3 coats of wood floor oil start from around £19.00 per m2. Lime washing or whitening costs around £4.00 per m2 per coat and gap filling using sawdust and resin costs around £4.00 per m2 (assuming small gaps up to 3mm, for wider gaps filling is done using wooden slivers and costs around £10.00 per m2). For staircases, sanding and sealing prices start from around £40 per step, rising up to £70 per step depending on condition and layers of paint. To find the best price, use the free quote service on this site to gather quotes from 3 recommended tradesman or floor sanding companies near you, it only takes a couple of minutes then you can let companies get in touch with you to offer prices and advice. The two most popular wood floor finishes in the UK are Lacquer/Varnish and Oil (sometimes known as Hard Wax Oil). The best finish to use entirely depends on personal taste and the desired look or appearance of the wood. Lacquer or varnish is more hard wearing with a choice between high gloss and matte appearance. There are even lacquer products available with give the same appearance as an oiled floor to look more natural. The disadvantage of a lacquered finish is that damage caused with a sharp object is noticeable and the lacquer doesn't protect the wood any more in the damaged areas. The only proper solution when lacquer is damaged is to sand the complete floor and to apply a new coat. In addition applying a proper lacquer layer on a wooden floor is not an easy task, it is a job best left for a specialist. Applying a Hard Wax Oil on wooden flooring will prevent any moisture coming into the wood, while allowing the wood to breath. It also keeps the natural look of the wood and is very easy to apply and pretty much anyone can do it. Hard Wax Oil is also very resistant to abrasive movement and damage is very easily repaired with some wax or maintenance oil, unlike with varnish, there is no need to sand the whole floor again. On the downside, Oiled wooden flooring requires more maintenance than a lacquered floor and you still need to re-oil your floor every 18 months or so to maintain the finish.